The inspiration behind AmoChef came during a Gramma’s birthday dinner, where Hugo had the idea to empower ordinary people who are passionate about cooking, sharing and cultures. What if you could book your own Chef for that special date? Or learn to cook a different cuisine from across the globe with an expert? AmoChef is here to make that happen, by giving everyday people access to great chefs. 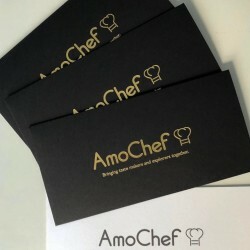 AmoChef offer gift vouchers that allow the lucky recipient to book unique food and drink experiences with a private chef in their own home! Each experience is different and has been carefully curated by chefs/cooks from all around the world. So you can explore the cultures of the world through a true culinary experience, and go beyond having just a meal.